In the unfortunate event of fire, it is imperative that everyone around is notified to given the best chance of escaping a blaze unscathed. Of course, the easiest and most effective method of this is the fire alarm. They alert people of danger with their loud, recognisable sirens and offer an added peace of mind for safety. Not all places are able to accommodate the wired alarms that are present in most buildings. That’s why Fire Safety Store offers a selection of manual fire alarms ideal for temporary outdoor use such as construction sites, caravan and camping sites and festival and events sites where there is no real possibility of being able to install a more conventional alarms. Our manual fire alarms have been tried and tested and we can confidently state that they offer the most effective and efficient solution for places and people who need a practical safety plan without the ability for wired connections. Our range consists of rotary fire alarm bells, gas alarms and pump horns and triangle fire alarms so you can be sure to find the right solution right here onsite. The rotary alarm bell is the traditional fire alarm that has been used for many years. It has now been improved for better performance than ever and to provide an even better means of alerting people to evacuate. 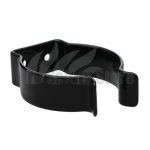 It is manufactured using very strong aluminium, making it strong and durable and such is perfect for outdoor use. This easy to use, hand operated warning device is simple in its workings; all that has to be done to sound the 60dB siren is a mere turn of the handle. It is a cost effective and practical manual fire alarms product capable of delivering a loud enough warning for everyone in close proximity (up to 35m). Emergency gas alarms are well suited to a wide range of environments and can even be used by children thanks to their simple to use makeup. 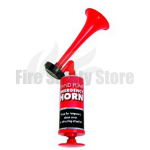 Once the horn head is attached, the canister just needs to be squeezed at the right end and a loud noise audible for up to 1500m for a cost effective yet efficient warning sign. 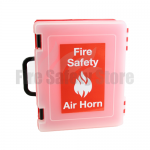 The triangle fire alarm is one of the most cost effective manual fire alarms. It is essentially very similar to the musical instrument in the sense that users simply strike the triangle with a stick to sound the alarm. This makes it very easy to use and means that even little children can raise the alarm. Our manual fire alarms are covered by our next day delivery offer. Order before 2pm and you could be receiving your equipment the very next day. If you have any questions concerning manual fire alarms, or any other of our fantastic choice of products, call our team of experts today on: 0800 316 0890 to see how you can enhance your fire safety arrangements.